On a routine mission, SG-1 unwittingly aids a fleeing criminal and is condemned to life imprisonment on the penal world Hadante. Strangely, the most powerful person on Hadante is Linea, a gentle and educated woman with an unusual influence over the violent inmates. SG-1 strikes a deal with Linea, to help her escape in exchange for using her cold fusion to power the stargate. It is only after their escape that SG-1 learns the true story behind Linea. Accused of causing global plagues, she has come to be known as "The Destroyer of Worlds." And SG-1 has just set her free. The Taldor is the judicial body that controlled island states that were at war when the Destroyer of Worlds brought a plague that wiped out half the population. SG-1 was sentenced to life in prison on Hadante for trespassing with weapons on ancient grounds and aiding a murderer. Hadante used to support life. The prison is the ruin of an alien gate terminal over 15,000 years old. 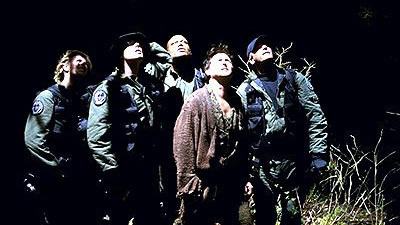 SG-3 under Major Warren was sent on a rescue mission to recover SG-1. SG-9 under Major Stan Kovacek handles diplomatic problems and was sent to negotiate with the Taldor. O'Neill implies previous experience as a prisoner. This is General Hammond's first trip through the stargate. SG-1 escaped to P2A-509 to rendezvous with SG-3. Linea's activators interact with the tare root to create organically based cold fusion. Linea's parting message: "Thank you for your kindness. All debts have now been paid."